Today the Swiss National Bank removed the CHF/Euro peg and the Swiss Franc shot up relative to the USD. In the chart below we can see the almost 15% drop in the value of the USD relative to the Swiss Franc. Considering our focus on investing in the most intangible-rich companies in the world, it is no surprise that we follow investments in intellectual property very closely. Unsurprisingly, corporations in developed countries invest more in R&D, advertising, and firm-specific resources than their emerging market counterparts. 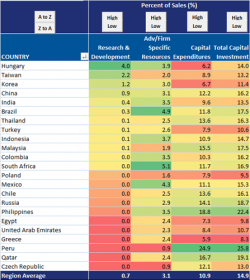 The MSCI All Country World index (MSCI ACWI) is comprised of two major sub-indexes: the MSCI World Index (80%) and the MSCI Emerging Markets index (20%). 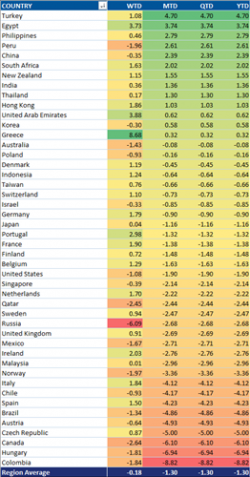 On a year to date basis, measuring average performance in USD, the best performing group of companies are from Turkey and the worst are form Colombia. By almost any measure stocks are pricey relative to history. We’ll save the theoretical debate about whether such high valuations are justified for another post, and will instead illustrate with charts just how far valuations have come over the last five years. 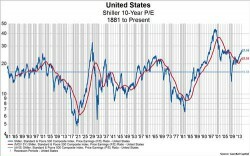 The Shiller P/E just made a new cycle high in December of 27.1x. While negative five-year yields in Germany and Switzerland has been a feature for some time, Japanese yields have up until now resisted the temptation to go negative. Today, however, the Japanese 6-year yield crossed the line into the realm of negative yields. 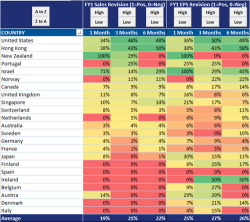 With earnings season on the horizon, we thought we’d take a quick tour of estimates around the globe. Positive revisions to sales and earnings estimates in developed countries have hovered around 20% to 25%, respectively, over one-, three-, and six-month time periods. 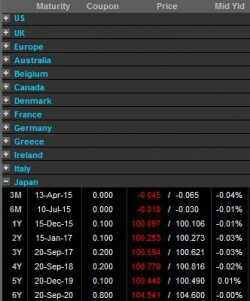 IMF data released earlier this week revealed the largest ever quarterly decline in reserves held in euros. As one measure of market volatility, we calculate the cumulative number of stocks in the MSCI World Index that open at least 2% higher (or lower) than the previous close over a 65-day time period. Extremes in the number of gaps often occur in conjunction with inflection points in the market.